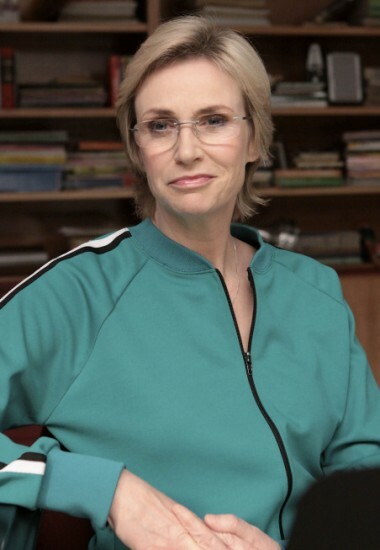 Sue (Jane Lynch) full-on rocked it in "Throwdown." Open on Will and Sue (remember, she’s co-running the glee club now, after last week’s drug fiasco), slow-mo duking it out alongside awesome voiceovers. While Will frets about morphing into a character as devious as his opponent, Sue unsurprisingly remarks on how elegant she looks, even in the heat of battle. Classic Sue, and fortunately only the beginning of her biting wit and perfect delivery present throughout the entire episode. Finish this scene off with the ridiculous Principal Figgins making Will and Sue “hug it out” and you know we’re in for a wild ride here, Gleeksters. Let’s move on to some adorableness, shall we? Quinn has an appointment with her baby doctor and Finn feels too shaken up about it to drive them there, so he calls upon good ol’ Mr. Schue. And then proceeds to tell Will that he doesn’t know how he can take care of a real person when his mom won’t even let him have fish – even though apparently this isn’t actually an issue right now because Quinn has told Finn that she plans to give the baby up for adoption. Still, the moment is ridiculously sweet and clearly resonates with Mr. Schue and his lack of involvement with his own girl’s pregnancy. So much so, in fact, that he wants to go to Terri’s next appointment. Uh-oh! Hey, look who’s back, it’s Nerdy Newspaper Guy! I Googled him and apparently his name is Jacob – good to know, but I prefer my name for him. Anyway, apparently Nerdy Newspaper Guy knows that Quinn is pregnant and plans to spread this salacious secret on his gossip rag of a blog. That is, unless Rachel makes him an offer he can’t refuse…like giving him a pair of her underwear. Creepy much? But hey, she did it for the good of the glee club! That’s what she tells Finn, so it must be true. It has nothing to do with the crush the size of Jupiter that she has on Finn. Nope. Nothing at all to do with that. Alright, back to the “Throwdown” part of the episode. As part of her bring-down-the-glee-club-from-the-inside mission, Sue divides the group into two: one for her to captain, and one for Will. With a goal of focusing on the minorities, Sue calls out the recruits for her “Elite Glee Club,” nicknaming them all oh-so-hilariously as she goes: Santana (one of the Cheerios, and the only one who gets called by her real name), Wheels (Artie), Gay Kid (Kurt), Asian (Tina C.), Other Asian (Mike Chang), Aretha (Mercedes), Shaft (the other new glee club guy who has yet to be name-checked). To please her group of so-called misfits, she gives her lead singer exactly what she wanted by giving Mercedes her much desired “black song” and letting her do “Mariah hands” on Jill Scott’s “Hate On Me.” Admittedly I’m not very familiar with the original version of this tune, but Mercedes and her Merry Misfit Minorities made it fun to watch, plus “Aretha” always delivers when she gets the chance to shine. Skipping ahead a bit, Sue’s discovered that Will has flunked the majority of her stupid Cheerios (no, seriously, they really are stupid – one spelled her own name wrong at the top of a test) and now they’re not eligible to cheer. Cue the over-the-top dramatic music which will reappear not once, but twice more before the episode comes to an end. Naturally, Sue throws a hissy fit, landing both her and Will back into Principal Figgins’ office, where Sue debates the necessity of her Cheerios learning Spanish. “Should they learn Spanish? Sure, if they want to go on to be dishwashers or gardeners.” Ouch, Sue – I thought you were supposedly sticking up for minorities? Ha! Rather amazingly considering Figgins’ previous track record of dealing with Will vs. Sue issues, Mr. Schue comes out on top of this battle, and thus cue the over-the-top dramatic music once again while Sue throws things around like someone who belongs in a loony bin. Now that's one messy love triangle: Rachel (Lea Michele), Quinn (Dianna Agron), and Finn (Cory Monteith). Flip to Finn and Quinn in Mr. Schue’s Spanish class. The kids are supposed to be writing a test, but instead Finn is passing notes to his knocked-up cheerleader about baby names. Apparently he thought that Gwyneth Paltrow naming her baby “Apple” was awesome and unique and, thus, he thinks the name “Drizzle” would be perfect for their little girl. Oh, Finn, sweetheart. I love you, I do. You’re super cute and a good singer and you’re very sweet. But you’re also very dumb, and, please oh please, do not name your child “Drizzle.” I rarely side with Quinn due to the fact that she’s only pretending that you’re her baby’s daddy, but I’m 100% backing her in freaking the hell out on you on this one. This baby name fight leads, however, to the rather expected “Don’t you dare cheat on me with Rachel” fight. Not only does Quinn make this message clear to her baby’s fake daddy, but also to Rachel, who battles back with (extremely accurate) insinuations that Quinn is working as Sue’s spy to bring down the club. And it’s straight into another song! To counter Sue’s group’s song of hate (rather literally, given the title), Will’s given his group a sappy love song to tackle. And, as per usual, he’s given the leads to Rachel and Finn, thus leaving Quinn to glare angrily in the background while the potential lovebirds look at each other all googly-eyed throughout Jordin Sparks and Chris Brown’s “No Air.” Although a bit cliché, the song fits perfectly into the plot of the episode, and surprisingly I rather enjoy listening to it even though I’m not a fan of the original. On the flip side, the wind machine in the hallway blowing Rachel’s hair around (not anyone else in the hallway’s hair, just Rachel’s!) was a massive fail and ridiculously hilarious in a bad, bad way. Moving away from the musical numbers for a bit, several less exciting scenes happen in fairly quick succession: Sue reveals her plot to unite the “minorities” against Will (now roping in the Jewish Puck and the Dutch Brittany, as well), Will makes an appointment for him and Terri to go to the baby doctor together…and we’re back to singing. Woo! I told you this episode was packed with tunes. So apparently Quinn’s pissy due to all the drama in her life, and has decided to let it all out by channeling her inner 60s diva and leads the Cheerios in a music video-esque rendition of The Supremes’ “You Keep Me Hanging On.” The song rocks, and Quinn rocks at singing it, but the scene itself seems so unnecessary that overall I wasn’t a huge fan. It’s time for Will’s club against Sue’s club, and now that Sue’s pulled the minority shtick, all Will’s got left is the love triangle crew. Sue starts stirring up trouble (again!) and soon the supposedly responsible teachers are duking it out (again!). The kids, however, come out the winners this time around, with Finn rather bluntly telling S & W that if they wanted to hear fighting, they’d stay home and listen to their parents. Being the expert at throwing a fit and storming out, Rachel instructs the other Gleeks to follow her out, which they do, and it involves the boys carrying the wheelchaired-Artie up the auditorium stairs. Best storm out ever! I admit that I hate to even address the next major plot point, and thus I’ll make it quick: Terri is now taking the pregnancy sham to ridiculous lengths and has somehow blackmailed her OBGYN to be in on the charade as well. This results in Will crying over a fake ultrasound and subsequently breaking my heart! I need this insane plot line to be over and done with STAT. The Gleeks rally behind Quinn with a tear-jerking Avril number. And it’s time for the closer! Sue somewhat inexplicably steps down as co-chair of New Directions, but claims that she still wants to contribute to the group. Will’s all emotional because of his wife’s ridiculous pregnancy sham that he doesn’t even know is a ridiculous pregnancy sham, and so he gives the reunited group a big spiel about how they’re all minorities (including sweet yet stupid Finn who admits that he can’t tell his right from his left), aww. But here’s the bombshell: Sue reveals that she knows Quinn’s preggers and that Nerdy Newspaper Guy is still printing the story (upon Sue’s request!) so come the next morning, the whole school will know about her blossoming baby bump. Quinn’s devastated, and the glee club unites to support her by belting out Avril Lavigne’s “Keep Holding On.” Once again, it’s a case of a bad song turned awesome with the aid of choral work and ballet dancing. Quinn’s teary-eyed the whole way through, and the episode ends perfectly with a close-up and audible sniff of sorrow from the former queen bee. Next week: PUCK + RACHEL! Also, WILL BREAKDANCING! Oh, and lots of slushies in faces. 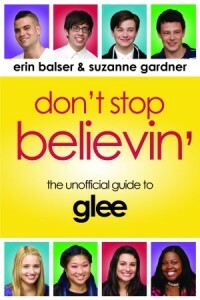 Stay tuned, Gleeks! ← Welcome to Gleeks United! The best thing to come onto the small screen in soooooo long! I love Glee!